As an authorised IB World School, Santa Maria College is proud to teach the Middle Years Programme (MYP) from Years 7 to 10. This internationally recognised approach to learning calls on students to engage with the content and concepts that underpin their learning. Girls at Santa Maria are encouraged to ask questions, seek answers and apply these new understandings to a real-world context. 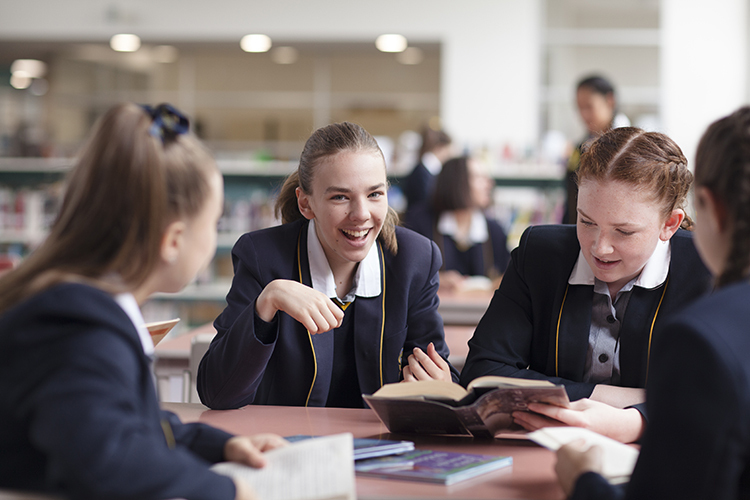 The MYP combines the content requirements of the Australian Curriculum with teaching and learning methods that have been found to promote deep understanding and rich experiences. This approach prepares students to tackle problems outside the classroom and equips them with the knowledge, skills and attitudes to be successful learners throughout their lives. The MYP at Years 7 to 10 is outstanding preparation for senior schooling, and students and staff at Santa Maria have found that completing the MYP gives excellent foundational knowledge and attitude for VCE success. The program offers some unique dimensions, which highlight its focus on holistic education. Two of these are the commitment to service (a fundamental requirement of the MYP) and the Personal Project, an individual pursuit students undertake in their final year. In completing service to the community, students are challenged to reflect on the needs of their community and the contribution each girl can make. This dovetails into the Benedictine value of service and creates opportunities for students to learn more about themselves and others. The Personal Project is a requirement of the MYP and allows each girl to generate her own inquiry, based on personal interest. This inquiry involves setting challenging goals, answering conceptual questions and each girl reflecting on her own learning. The incredible outcomes of these projects highlight the process of learning and provide an opportunity to celebrate the achievement of each student. The Personal Project is the culmination of the 7 to 10 learning journey, requiring students to demonstrate the skills of learning they have developed across the four years. It is a truly unique and wonderful dimension of the MYP at Santa Maria College. In a contemporary world, the capacity to collaborate, problem solve, persist and inquire is essential. When knowledge is ‘Google-able’, the important skill is not in obtaining knowledge; rather in critiquing, applying and reflecting upon it. In recent studies of employability, attitudes often arise as incredibly important to job success. Krishna (2014) cited in ‘Employability skills that recruiters demand’ that communication skills, problem-solving attitudes, judgement and decision-making were considered crucial in the current job market. The MYP structure teaches students these skills and requires them to apply them to relevant learning at Santa Maria. For further information, visit www.ibo.org. Mishra, Krishna (2014). Employability skills that recruiters demand. IUP Journal of Soft Skills. 8(3), p. 50–55.